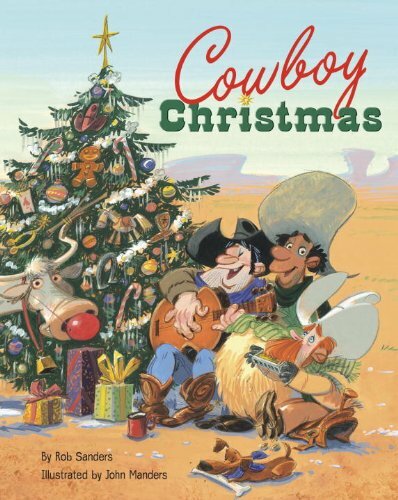 I bought this book – Cowboy Christmas by Rob Sanders – as a Christmas gift for my grandson and borrowed it from him to review. He said he likes the book, and then enjoyed reading it to me. Even though it currently is not in season, Cowboy Christmas is well worth the read anytime. Rob Sanders is expert with words, using some that will broaden a child’s vocabulary while enhancing the story. He has written such a cute twist on the idea of preparing for Christmas when things are not the same as one is used to having available. Three days before Christmas four cowboys are in the desert – three are taking care of a herd of longhorn cattle and the fourth is the fatherly cook. The three worry that “Santy” won’t find them way out in the desert. They individually lament over being without a Christmas tree with decorations, yummy Christmas cookies to eat, and horses to dress up as reindeer to hitch to a wagon. Cookie (the cook) quietly convinces each that they can do that, and each makes the attempt – with hilarious results. For example, did you ever see a cactus Christmas tree with cans of corn hanging from it in lieu of popcorn? Rob Sanders wrote: Dub corralled cans of corn. “No corn popper,” he explained. The surprise ending (for the young reader) is satisfying and yet leaves the reader imagining what is coming next beyond the end of the story. The illustrations by John Manders are colourful, funny, and well-matched to the story, adding great visuals to the descriptive words. Visit Rob Sanders’ very informative website (www.robsanderswrites.com) and check out the trailer for Cowboy Christmas, a book you may want to buy now for a young reader for Christmas – or anytime. You can find Cowboy Christmas listed on my BUY THE BOOK! page. This entry was posted in Mostly About Reading, Reviews & Interviews and tagged author Rob Sanders, Book review, Christmas, Cowboy Christmas, cowboys, desert, Golden Books, illustrations, illustrator John Manders, Picture book. Bookmark the permalink. My Dad was a cowboy so this would be a fun book for the little ones in our family. I’ll keep it in mind. Thanks!